Here's another eye opening story from the floors of Computex 2017. Asus ROG has produced AMD motherboards before, but never a laptop featuring an AMD CPU. 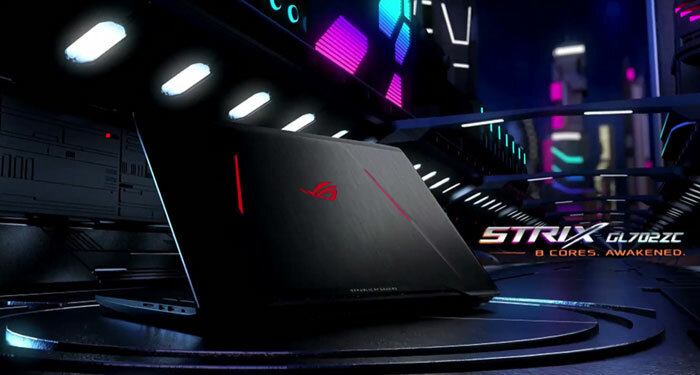 At Computex Asus ROG showcased the Strix GL702ZC gaming laptop that not only features an AMD Ryzen CPU, but also a top of the line Radeon Polaris GPU, and a FreeSync display panel. 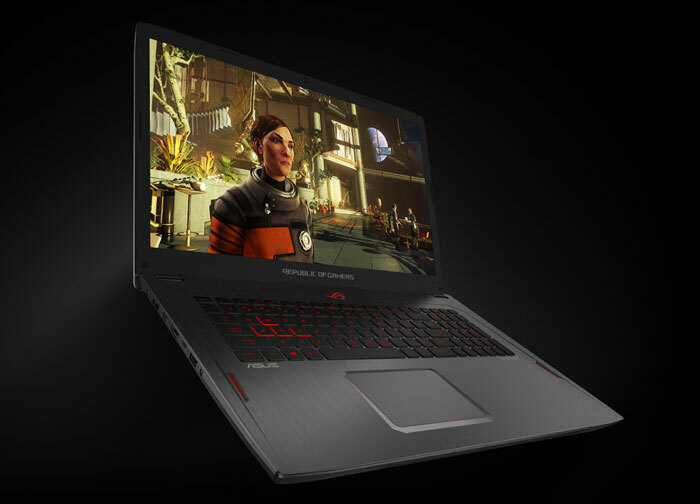 Of course Asus ROG hasn't neglected supporting components and the laptop also boasts expansive fast RAM options, M.2 NVMe SSD support, and other premium modern technologies. The Asus ROG Strix GL702ZC gaming laptop is built around a 17.3-inch display. Asus will offer multiple configurations including a 4K version that tops out at 60Hz, plus 1080p variants at 75Hz and 120Hz - all matte coated IPS panels with AMD FreeSync support. At 1.3-inch (33mm) thick and a weight of less than 7lbs (3.2Kg) this isn't the biggest and bulkiest 17-inch sized gaming laptop, especially considering its powerful internals. Pricing for the various GL702ZC configurations will be shared as these laptops become available "later this summer". The keyboard could be bigger and the tracking pad completely removed in my opinion. Add an optional touchscreen instead. But the hardware seems like a good combination. Looks pretty good and specs are pretty nice, looking forward to seeing Intel vs AMD competition in the luxury brand of gaming. Like the concept of Ryzen in laptops, but not sold on Polaris in laptops. Especially the biggest Polaris they have. Bring on thorough testing, huh? If it works then this could be the start of something nice for AMD, getting in on the laptop GPU protection racket NVidia runs. Is it actually the biggest Polaris they have though? Or is it like the old days where the “Mobility Radeon 9800” is actually close to a desktop 9600? Cause I don't see them cutting down a 150W+ RX 580 to 65W through clock throttling alone. Looks like the CPU is at least a full desktop CPU and not a lower model upmarketed because mobile. wccftech claims it's a 65W RX 580 with 2304 stream processors that boosts “beyond 1200Mhz”. If so holy carp, that's a full desktop chip, that's been cut from 150W to 65W by cutting 20% off the clockspeed. Not sure if I should be amazed how much they've improved the efficiency, or how desperately hard they must have been driving it before. Or how inaccurate the information is. Looks like you've answered your own questions? 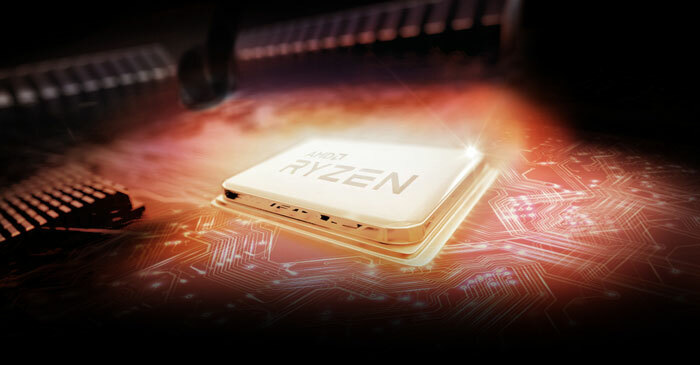 It does seem a bit crazy that they could pull it off, but the general consensus is that the last couple of generations of AMD GPUs come out of the factory with a voltage as high as they can safely push it for maximum yield and greatest clock speeds. It doesn't surprise me, therefore, that efficiency is easy to gain. But 2304 SPs in a laptop sounds… warm. And loud.